Take a walk through Mayfair and you’ll be inundated with swanky hotels, expensive shops and fast cars. You can almost smell the money. With Soho, St James’ Hyde Park and Marylebone circling the area, it’s no wonder that Mayfair is overflowing with some of London’s very best restaurants and bars. You have the splendour of Claridge’s, the ritzy Roka and Sketch’s infamous interior which draw attention, but now and then, you need to go off the beaten track to find a hidden gem. Located in the snug confines of Lancashire Court, Mews of Mayfair encompasses a charming network of restaurants and bars. Make your way through the courtyard bar and you’ll find the first-floor brasserie, a restaurant specialising in pizza, a late night lounge and a street-level swanky cocktail bar. In search of good drinks and light bites, we made a beeline for the latter. 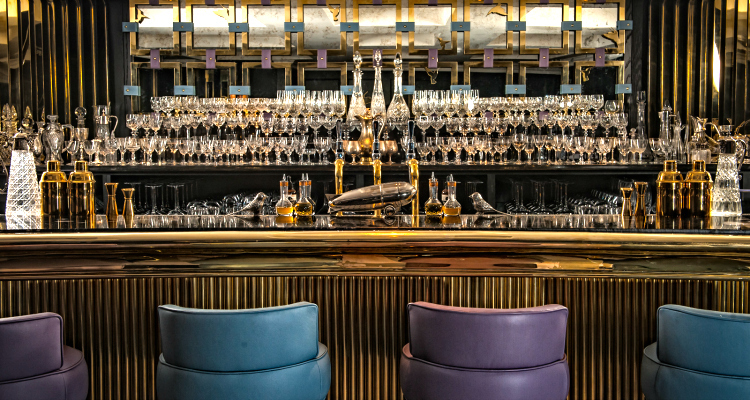 Gold accents, plush seating and an impressive bar steal the show at Mews of Mayfair. If you’re after classic cocktails, then you’ve come to the wrong place. 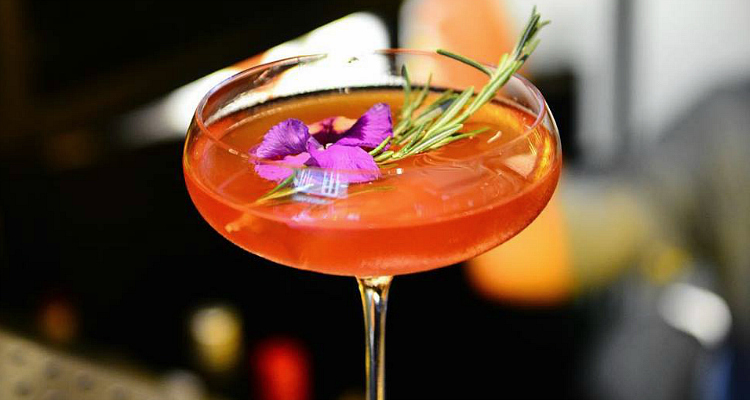 Drinks here have a modern spin, using inventive methods and fun ingredients; martinis are ‘twisted,’ spritzes have an eccentric edge and there’s meringue all over the place. Signature cocktails include the meringue-topped Amor Y Amargo (£12) and the Saliza Sour (£11) which combines Saliza Amaretto with Chambord, pineapple, lemon and egg white for a punchy kick. Push the boat out with a Son of Islay (£14) which arrives in a smoked cristal decanter, filled with Ardberg Whisky, Antica Formula and white cacao before tucking into sharing boards, nibbles and pizza planks. With a taste for porcini muschrooms and black truffle, we opted for the truffle pizza (£9) paired with aubergine and courgette arancini (£5)… a match made in heaven. Quirky yet refined: you haven't tasted anything like this before. If you’re after cocktails or quick bites in Mayfair without the pretentious attitude, then Mews of Mayfair is your place. The interior is warm and inviting, yet the gold accents and plush seating give a glamorous touch. Hidden away in a historic courtyard, this unique space is a great location for after work drinks. Plus, if you get a sudden hankering for pizza or a late night dance, you won’t have to look very far.